1982 "Delta" series executive desk and rolling storage cabinet designed by Jean Louis Berthet in the 1960s, later re-issued by Berthet at the request of Mobilier International. The desk is made of black gloss coated steel and aluminum, lacquered wood edges, burled sycamore veneer wood, and black leather. It is supported by three cylindrical legs and the large triangular top has cropped corners, rounded edges, an inset, black leather writing surface, and two narrow drawers on each side along that same edge. The matching storage cabinet is on castors, has two drawers, and fits underneath the desk. The Delta series was designed to accommodate the period's evolution of office atmosphere, communication, and dialogue, as well as supplement the workplace's incorporation of technology. Recently reduced in price due to a recent move. Executive desk manufactured by Tecno comprises a squared boomerang shaped wood top, a black enameled base with brass feet and three grey enameled metal pull-out drawers. 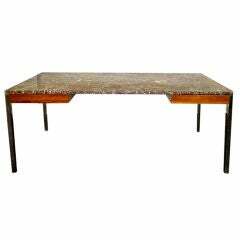 Single drawer executive Platner desk with a top in natural stained, bullnose oak and cream colored leather, supported on two legs in polished steel.